Crawford: If I Beat Indongo - I'm The Pound For Pound Best! 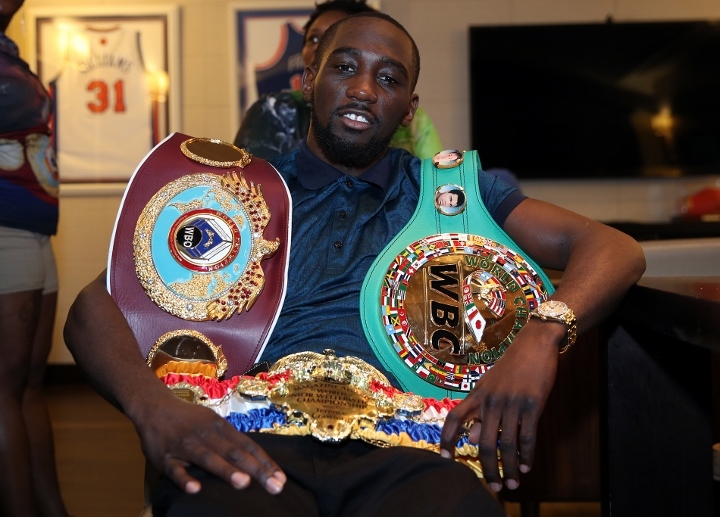 Terence Crawford, who holds the WBC, WBO, Ring junior welterweight titles, believes he's one victory away from taking the throne of being the best pound-for-pound boxer in the sport. Crawford will face another undefeated boxer in the coming weeks, Julius Indongo, in a very historic contest. Indongo holds the WBA, IBF, IBO junior welterweight titles. Indongo has a record of 22 wins and 12 by knockout. The scenario will place six titles at stake in the bout, which ESPN will televise on August 19 at the Pinnacle Bank Arena in Lincoln, Nebraska. At the moment, Crawford believes the top man in the sport is WBA/WBO/IBF light heavyweight champion Andre Ward. "For me, the best at the moment is Andre Ward," Crawford said to ESPN Deportes. But Crawford feels that he should take the mantle with a victory in less than two weeks. "If I win this fight, I will be the first boxer to own six world championship titles and would have to be recognized as the best pound for pound," said Crawford, who has a record of 31-0 with 22 wins by knockout. The talk with Crawford began with insights on his next fight against Indongo, the triumphant Super Ligero triple monarch recognized by the AMB, IBF and IBO, 34 years old, native of Namibia and who has 22 wins, half before Of the limit, without knowing the defeat. Indongo is a rival whom Crawford does not take lightly, despite his veteran. However, suddenly, some of the reporters present who are members of the association that votes to classify the top 10 pound-for-pound fighters were put up against the wall and questioners were questioned by McIntyre. "Now I want to be the one to ask," said Crawford's attorney. Crawford disagrees with middleweight king Gennady Golovkin holding the top spot, as some have him ranked. He says Golovkin's upcoming opponent, Saul "Canelo" Alvarez, should be better ranked. "The question is, who has he beat? That is what should be evaluated and not just establish that a boxer deserves the vote just by winning a fight. We must value the quality of the opponent and the way he won. For me, Canelo must beat Golovkin," said Crawford. Crawford's #2 P4P in my book. Depending on what Ward does next he could easily slide into the number 1 spot. Giving he beats Indigo of course.